A clump of dark matter has apparently been left behind after a violent collision of galaxy clusters. This dark matter clump contains far fewer galaxies than would be expected if the dark matter and galaxies hung together. Astronomers used Chandra, Hubble, and the Canada-France-Hawaii, and Subaru telescopes to observe Abell 520, which is 2.4 billion light years away. This latest result agrees with a similar conclusion that was announced in 2007. This composite image shows the distribution of dark matter, galaxies, and hot gas in the core of the merging galaxy cluster Abell 520, formed from a violent collision of massive galaxy clusters that is located about 2.4 billion light years from Earth. Thanks a lot for the composite image of Abell 520 observed via Chandra, Hubble, the Canada-France-Hawaii and Subaru telescopes. 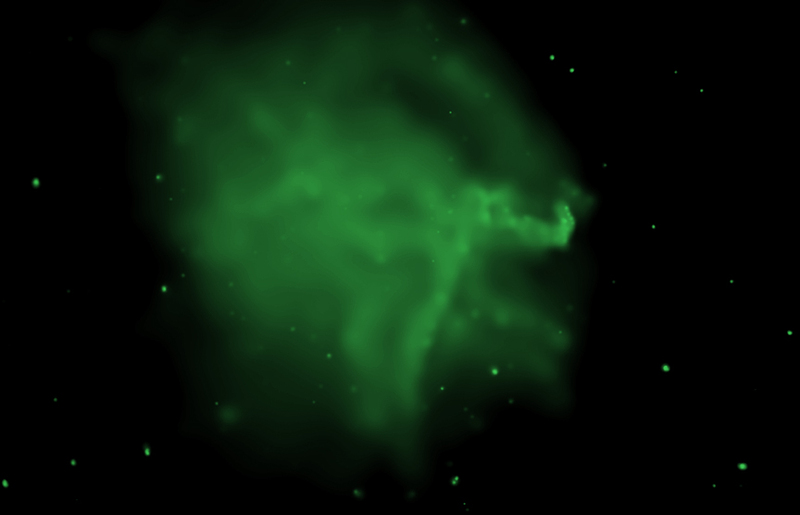 Sometimes I spend too much time on intriguing images provided by Chandra X-ray Observatory. It would be nice if the color code were included so that one could tell where the DM was. Is the DM green, blue, pink, yellow? The center of the image core does not seem to be empty. The Bullet collision seem to one in progress, while this one seems long after the collision. Could the Bullet evolve over time to a similar? configuration. 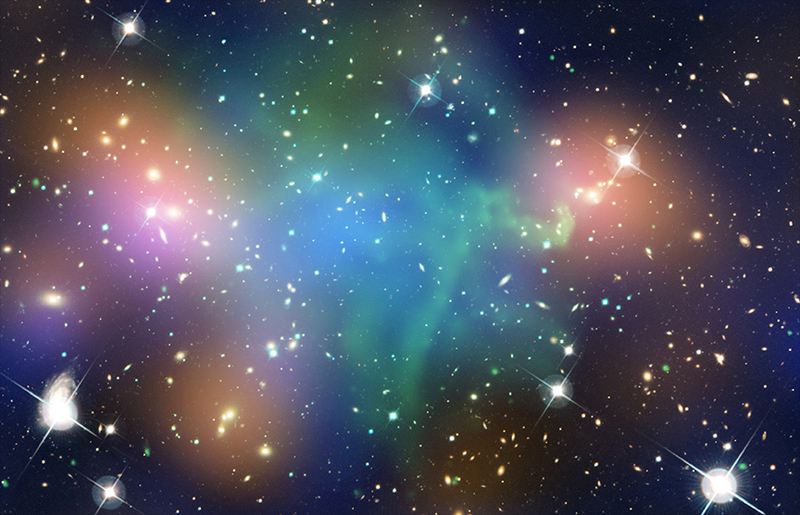 A collision of massive galaxy clusters located about 2.4 billion light years from Earth. About 2.4 billion light years from Earth. X-rays from Chandra X-ray Observatory with Optical data from Hubble and the CFHT and starlight from galaxies within the clusters, derived from observations by the CFHT. About 5.4 million light years across. X-rays are green, Optical in red, blue & green, Mass in blue, and Luminosity in orange.